When we want to get good at something, we look to those who have already achieved highly in that area. Would you take weight management advice from someone who thought cream puffseb were a healthy afternoon snack and hadnt exercised since they were 10? Probably not. You want your personal trainer to look amazing in lycra and have a six pack. In the same way, you wouldnt want your teen to mimic the study habits of a student who gets less than stellar grades. 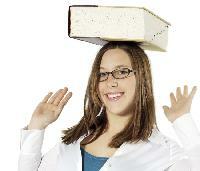 You want your teen to adopt the same study habits kids who get straight As have. 02. What is the earth like inside?